I obtained this from one of Great Britain's long established institutions, a car boot sale. The classic finger marks in the dust on top of the box, the peeled back plastic box cover and the absence of instructions made me realise that this was either a onced loved video game classic or a forgetten mess left for the family dog to gnaw on when they was ever in the child's bedroom. The latter seemed more appropriate. 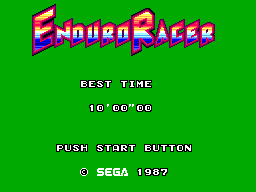 After fiddling with the cartridge to get it to work, the title screen appeared. You have a certain amount of time to complete the first race to continue to the next race. Unless you use the "avoid the jumps" method I doubt you would get to the finish line before the clock. As you attempt to complete the races you realise this isn't a fun ride but more of a dodge anything or you will not make it. I've always found this game a weird one for graphics. It's meant to be a mega cartridge but its got the same level of graphic ability as a standard "sega cartridge" like Super Tennis or Teddy Boy. They are quite awful really but the "Scooby Doo"-esque background are the most annoying with its block colour background and tedious placed trees/ ramps etc. This could have been so much better. In a word, pointless. There is no music just the "putt putt" sound of your 30cc motorbike. There's a sense of pleasure when you finish a race, not because you made it past the finish line, but you know there is restbite from the bloody sound! 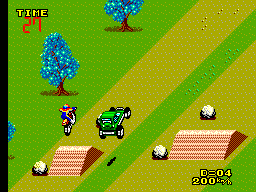 The controls of your motorbike make you turn the bike so quick, you have to spend most of you time trying to correct your movements as well as dodge obstacles and keep an eye on the time. An improvement could have been made all round. Quite simply, there isn't any replay value. The game is very pointless and makes your blood boil in under a minute. Its shoddy graphics and irratating controls will make you throw the game across the floor and question why you spent any money at all on this failure. I have always shook my head in disbelief that this game cost more than a pound 20 years ago. Its not even worthy of purchasing just for a hardent fans collection. 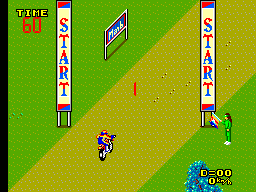 Stick with Hang On or if you can find it, Road Rash!